Mink served in the U.S. House of Representatives for a total of 12 terms, representing Hawaii's at-large and second congressional districts. While in Congress she was noted for co-authoring the Title IX Amendment of the Higher Education Act. Mink was the first non-white woman and the first Asian American woman elected to Congress. She was also the first woman elected to Congress from the state of Hawaii, and became the first Asian-American to seek the presidential nomination of the Democratic Party in the 1972 election, where she stood in the Oregon primary as an anti-war candidate. From 1978-81, Mink served as the president of Americans for Democratic Action. Mink's parents were second-generation Japanese Americans or Nisei. She was a Sansei, or third-generation descendant of Japanese emigrants. Her father, Suematsu Takemoto, was a civil engineer. Her mother, Mitama Tateyama, was a homemaker. Suematsu Takemoto graduated from the University of Hawaii in 1922, the first Japanese American to graduate from the University of Hawaii. For several years, Mink's father was the only Japanese American civil engineer working in Maui. He was passed over for promotion several times during his career, the positions instead offered to white Americans. He resigned his local position in 1945 in the aftermath of World War II, and moved to Honolulu with his family. He established his own land surveying company in Honolulu. Mink's maternal grandparents were Gojiro Tateyama and his wife Tsuru. Gojiro was born in the Empire of Japan during the 19th century. He arrived in the Territory of Hawaii late in the century, and was employed on a sugarcane plantation. He later moved to Maui, and was initially employed as a worker for the East Maui Irrigation Company. Subsequently, Gojiro was employed as a store manager and filling station employee. He also delivered mail throughout the backcountry of Maui. The Tateyamas lived in a shack by Waikamoi Stream. They had eleven children. William Pogue, Gojiro's employer at the Irrigation Company, arranged to have the Tateyama female children educated at the Maunaolu Seminary, a boarding school for Christian girls located in the town of Makawao. Mink was born in Hāmākua Poko on the island of Maui. She attended Maui High School and in her junior year won her first election to become student body president. The month before her election, Honolulu was attacked by Japan. Her coalition-building strategy worked and she won a close election. In 1944, Mink graduated from high school as class valedictorian. Mink moved to Honolulu where she attended the University of Hawaii at Mānoa with medical school and a career in medicine her ultimate goal. During her sophomore year, she was elected president of the Pre-Medical Students Club and was selected as a member of the varsity debate team. She spent one semester (from September 1946–January 1947) enrolled at Wilson College, a small women's college in Chambersburg, Pennsylvania before transferring to the University of Nebraska where she once again faced discrimination. The university had a long-standing racial segregation policy whereby students of color lived in different dormitories from the white students. This annoyed Mink, and she organized and created a coalition of students, parents, administrators, employees, alumni, sponsoring businesses and corporations. She was elected president of the Unaffiliated Students of the University of Nebraska, a "separate" student government for non-white students who were prevented from joining fraternities, sororities, and regular dormitories. Mink and her coalition successfully lobbied to end the university's segregation policies the same year. After her successful fight against segregation at the University of Nebraska, Mink experienced a serious thyroid condition that required surgery and moved back to Honolulu to heal and finish her final year of college at the University of Hawaii. She earned bachelor's degrees in zoology and chemistry from the university. In 1948, none of the twenty medical schools to which she applied would accept women. A disappointed Mink decided the best way to force medical schools to accept women would be through the judicial process. Mink decided to go to law school. Mink applied to the University of Chicago Law School. Unusually, the school had admitted women from its inception in 1902, and Mink attended law school with several other women. Mink obtained her Juris Doctor degree in 1951. While attending the University of Chicago Law School, Patsy met hydrologist John Mink while playing bridge at the International House. He would become her husband and lifelong partner. Unable to find work as a married, female, Asian-American attorney, she returned to her student job at the University of Chicago Law School library while her husband found work immediately with the United States Steel Corporation. In 1952, Patsy gave birth to daughter Gwendolyn (Wendy), who later became a prominent author and educator on labor and women's issues. The family soon moved Hawaii in August 1952. By law, Patsy was required to take the residency status of her husband after marriage and needed to re-establish her Hawaiian residency in order to prove that she was eligible to take the Hawaii bar exam. After challenging the statute as sexist, Hawaii's attorney general ruled that since she had not ever physically resided in Pennsylvania, she had not assumed her husband’s Philadelphia residency status. After passing the bar exam in June 1953, Mink continued to face gender discrimination in finding work as an attorney in the private or public sector. She created a solo practice with the help of her father. She was the first Japanese woman to practice law in Hawaiian territory. Mink founded the Everyman Organization, a group that served as the hub of the Young Democrats club on Oahu. She was elected chairman of the territory-wide Young Democrats, "a group that would wield a remarkable influence over Hawaiian politics for several decades." In 1954, Patsy worked to help elect John A. Burns to Congress. The following year, she worked as staff attorney during the 1955 legislative session and drafted statutes and observed the inner-workings of the legislature. As the Territory of Hawaii debated statehood in 1956, Mink was elected to the Hawaii Territorial Legislature representing her district in the territorial House of Representatives. In 1958, she was elected to serve in the territorial Senate. In 1959, Hawaii became the 50th state of the Union and Mink ran in the Democratic primary for the state's at-large congressional seat. She was defeated by Territorial Senator Daniel Inouye. From 1962 to 1964, Mink served in the Hawaii State Senate. At the 1960 Democratic National Convention, a speech by Mink, a Hawaiian delegate, persuaded two-thirds of the party to keep their progressive stance on civil rights. Mink with Lyndon Johnson after his trip to Hawaii for a conference on the Vietnam War, February 1966. In 1964, Mink became the first Asian-American woman (and first woman of an ethnic minority) to be elected to the United States Congress. She served six consecutive terms. Mink took what she learned in high school and built some of the most influential coalitions in Congress. Her most important coalition was one to support the Title IX Amendment of the Higher Education Act, of which she was one of the principal authors and sponsors, prohibiting gender discrimination by federally funded institutions, an outgrowth of the adversities Mink faced through college. In 1970, Mink became the first Democratic woman to deliver a State of the Union response. That same year, she was the first witness to testify against President Nixon's Supreme Court nominee George Harrold Carswell, who would eventually be rejected by the Senate. Harry Blackmun would eventually be confirmed instead. Mink also introduced the first comprehensive Early Childhood Education Act and authored the Women's Educational Equity Act. All of these laws written by Mink were declared landmark laws by Congress as they advanced equal rights in America beyond what could be imagined during the time. Title IX Amendment of the Higher Education Act was renamed by President George W. Bush on 29 October 2002 to become the Patsy T. Mink Equal Opportunity in Education Act; she co-authored and sponsored the Act while in the House. In 1975 she was the chief sponsor of HR 9924, granting $5 million in total tax-payer contributions ($23.3 million in 2018 dollars) for both the state and National Women's Conference which President Gerald Ford signed into law. From 1975 to 1977, during the 94th Congress, Mink was elected to a position in the House Democratic leadership, as Secretary of the House Democratic Caucus. In 1976, Mink gave up her seat in Congress to run for a vacancy in the United States Senate. After she lost the primary election for the Senate seat to Spark Matsunaga, President Jimmy Carter appointed Mink as Assistant Secretary of State for Oceans and International Environmental and Scientific Affairs. She served under Cyrus Vance and Edmund Muskie. After her service in the Carter Administration, Mink settled in Honolulu, where she was elected to the Honolulu City Council. Her peers on the council eventually elected her Chairwoman, and she often butted heads with the controversial Mayor of Honolulu Frank Fasi. In 1990, Mink was elected to her old House seat in a special election triggered when her successor in the House, Daniel Akaka, was appointed to the Senate. She was elected to a full term later in 1990, and reelected six times. She served alongside Neil Abercrombie, who represented the inner Honolulu-based 1st District. On August 30, 2002, Mink was hospitalized in Honolulu's Straub Clinic and Hospital due to complications from chickenpox. Her condition steadily worsened, and on September 28, 2002, Mink died in Honolulu of viral pneumonia, at age 74. Hawaii and the nation mourned; Secretary of Defense Donald Rumsfeld ordered all flags at military institutions lowered to half staff in honor of her contributions toward the equal rights of Americans. Mink received a national memorial and was honored with a state funeral in the Hawaii State Capitol Rotunda attended by leaders and members of Congress. She is buried at the National Memorial Cemetery of the Pacific. In 2007, Central Oahu Regional Park on Oahu was renamed "Patsy T. Mink Central Oahu Regional Park" in her honor. Mink's death occurred one week before the 2002 primary election, too late for her name to be removed from the general election ballot. On November 5, 2002, Mink was posthumously re-elected to Congress. Her vacant seat was filled by Ed Case after a special election on January 4, 2003. In 2002 Congress renamed the Title IX Amendment of the Higher Education Act (which Mink coauthored) to the "Patsy T. Mink Equal Opportunity in Education Act." In 2003, Mink was inducted into the National Women's Hall of Fame. Documentary films about Mink's life and role in Title IX include: Rise of the Wahine, directed by Dean Kaneshiro and Patsy Mink: Ahead of the Majority (2008), directed by Kimberlee Bassford. She received a posthumous Presidential Medal of Freedom from President Barack Obama on November 24, 2014. Mink, Patsy; Hartmann, Heidi I. (Spring 1994). "Wrap-up". Social Justice, special issue: Women and Welfare Reform. Social Justice/Global Options via JSTOR. 21 (1): 110–113. JSTOR 29766793. ^ a b c Gootman, Elissa (September 30, 2002). "Patsy Mink, Veteran Hawaii Congresswoman, Dies at 74". New York Times. Retrieved May 20, 2013. 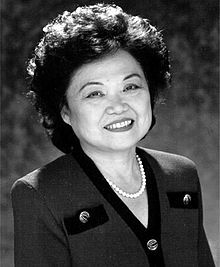 ^ "Patsy Takemoto Mink (1927–2002)". 2007-12-20. Archived from the original on 2013-09-04. ^ Judith A. Leavitt, "American Women Managers and Administrators: A Selective Biographical Dictionary of Twentieth-century Leaders in Business, Education, and Government" (1985), page 183. ^ Dorothy C. L. Cordova, Stephen Fugita and Hyung-chan Kim, "Distinguished Asian Americans: A Biographical Dictionary" (1999), page 246. ^ a b c d e Matusda, Mari J. (1992). Called from Within: Early Women Lawyers of Hawaii. United States: University of Hawaii Press. ISBN 978-0-8248-1448-9. ^ a b c d e f g h i j k l m n o p q r s t u v w x y z aa ab ac ad ae af ag ah ai "A Tribute to Patsy Takemoto Mink" (PDF). Asian Pacific Law & Policy Journal. 4 (2). Summer 2003. Retrieved December 25, 2016. ^ "HI At-Large - D Primary Race - Jun 27, 1959". Our Campaigns. Retrieved 2010-07-02. ^ "Democratic National Political Conventions 1832–2008" (PDF). Library of Congress. 2008. pp. 19–20. Retrieved June 6, 2012. ^ Lee, Ellen (2018-09-16). "Patsy Takemoto Mink's Trailblazing Testimony Against a Supreme Court Nominee". The Atlantic. Retrieved 2018-09-17. ^ "Women Elected to Party Leadership Positions". Women in Congress. U.S. House of Representatives. Retrieved 2012-06-06. ^ Kua, Crystal (October 2, 2002). "Mink tributes abound". Honolulu Star-Bulletin. Retrieved September 26, 2017. ^ "City Renames Park after Patsy Mink - Hawaii News Now - KGMB and KHNL". KHNL. Retrieved 2013-11-09. ^ "Rep. Mink's Name Will Remain on Hawaii Ballot". Los Angeles Times. October 11, 2002. Retrieved 25 December 2016. ^ "Dozens of Candidates Vie for 5-Week Congressional Term". The New York Times. November 29, 2002. Retrieved 25 December 2016. ^ "Case elected to Congress from Hawaii". CNN. January 6, 2003. Retrieved 25 December 2016. ^ "Title IX". Retrieved November 24, 2014. ^ "WOMEN MAKE MOVIES - Patsy Mink: Ahead of the Majority". Retrieved November 24, 2014. ^ "President Obama Names Recipients of the Presidential Medal of Freedom". The White House. Retrieved 24 November 2014. Seed, Suzanne (March 1974). Saturday's Child : 36 women talk about their jobs. Bantam Books. pp. 132–137. OCLC 5462796. Wikimedia Commons has media related to Patsy Mink. United States Congress. "Patsy Mink (id: M000797)". Biographical Directory of the United States Congress.